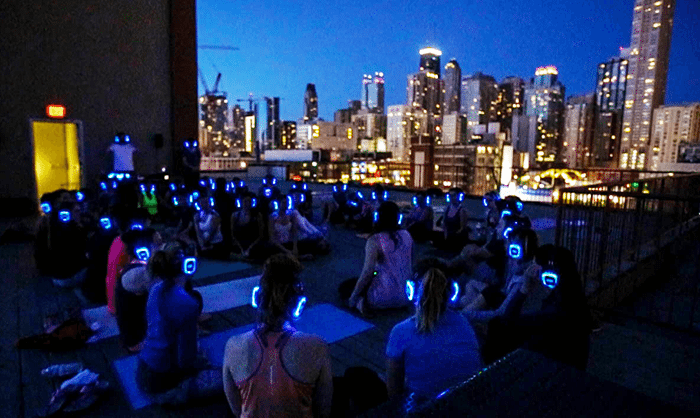 I climbed the seven flights of stairs to ENRGi Fitness‘s rooftop just as the sun was setting and laid out my mat next to more than 40 others, all of us wearing noise-canceling headphones that lit up neon blue all around. I was about to take part in a silent disco yoga class, provided by BENDER. First of all, silent? Second of all, disco? Yes, friends, a sunset, silent, yoga rave. Instead of thinking about how this class would go, if I would be able to hear the instructor over the music, if I would have issues wearing headphones while doing yoga, I decided to lie on my back and look up at the sky as I waited for class to start. The beats were already flowing as everyone was still getting settled, so I was able to slip into my own space and block out everything else going on. And that’s how I was able to practice for the entire hour. It was such a unique experience. At times I didn’t know if I was on the right foot or if I was still doing the same thing as my neighbor, but I didn’t care. And I think that was the purpose of the experience – to get lost in your own rhythm and see what comes up. The company, which hosts events in Los Angeles and Chicago, has been putting on rooftop events for the past three years. “BENDER started in Chicago, but after we found our mojo and built some momentum, I moved to Los Angeles to run BENDER full-time,” said creator Justin Henderson. The most fascinating component to BENDER events are without a doubt the Sound Off headphone experience. Personally, I felt like they helped me tune out anything that was going on with the people around me and allowed me to be solely focused on what was coming up for me on my mat. Justin agreed that the level of intimacy that the headphones create is a very important element to their DJ yoga vibes. After teaching rooftop yoga classes at ENRGi myself, I know how projecting my voice while dealing with the sounds of the city during a seemingly peaceful yoga class can totally detract from the experience, but these headphones were the perfect solution. Justin was also DJ-ing during class. The music flowed seamlessly from one sequence of postures to the next, so I hardly even noticed what I was listening to. But Justin’s love for music is another element that gives these events the “good vibes only” kind of feel. He’s got a unique description of the music that he likes to spin for class. All levels were welcome, and the class was easily accessible and modifiable for all. The class was only secondarily about the physical practice; what I took away from it was the feeling I got from this uniquely shared space for all that held such a personal experience for each person attending. You can still snag a ticket for this upcoming Tuesday, and keep checking their page for August and September TBD dates.